For whatever else I am a husband, a lawyer, a President. Check out the different trailers at their Official Youtube account! I thank Twentieth Century Fox Singapore and Shin Min Daily for the pair of tickets to the Singapore Premiere of Abraham Lincoln: Vampire Hunter 3D held at The Cathay. Being ignorant about the movie’s plot and reviews helped to keep my mind free of expectations and maintain an neutral stand prior to the movie. Thus, being able to enjoy the movie similar to a roller coaster ride. Never was there a dull moment as the vampires are on the standby and ever ready to shock the audiences. 3D effects add on to the impact. The process of slaying vampires were unforgettable. 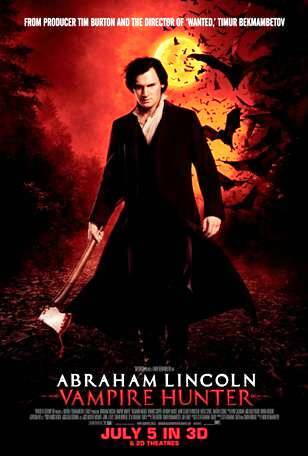 Benjamin Walker, stars as Abraham Lincoln: Vampire Hunter. Fear not, the 16th President of the United States is not a vampire! The movie was based on the 2010 mashup novel of the same name. Purely fictional. Cheers to the script and Tim Burton. Friends for the longest time ever – Will Johnson (Anthony Mackie) takes aim – times two — against an army of the undead. Chief of the vampires – Adam (Rufus Sewell) prepares to unleash the full wrath of the undead against their deadliest foe, the 16th president of the United States. Truly entertained by the movie where I get to witness vampire in their purest form apart from those young vampires who have come to conquer the world with their weak love story and frail looking faces. Remember, if your soul is impure, then revenging via killing vampires is impossible as “only the living can kill the dead”. And for those who are freaked out, here’s an advice, keep some silver with you wherever you go. Maybe you could consider a silver pocket watch, like Abraham Lincoln. P.S. Opt for 3D, it’s worth the money! All usage of mobile phones with video or audio recording capabilities, cameras or any wireless and recording devices are not allowed in the screening theatres. This screening will be monitored for unauthorized recording. By attending this screening, you consent to surveillance by security personnel. By attending, you agree not to bring any recording device into the theatre. By attending, you also consent to physical search of your belongings and person for recording devices. If you attempt to enter with a recording device, you will be denied for admission. If you attempt to use a recording device, you consent to your immediate removal from the theatre and forfeiture of the device and its contents. Unauthorized recordings will be reported to law enforcement and may subject you to criminal and civil liability. While reading these paragraphs, one can be sure that it is not strictly enforced due to the existence of smartphones. Though the staff would patrol and screen the hall occasionally. However, there are areas for improvement. Firstly, the collection of tickets at the Fox redemption table located on Level 6, from 1830 onwards. There were many ticket giveaway contests organized for this Premiere, hence it would be greatly appreciated if there were conspicuous labels indicating the collection of tickets from different contest in the two or four lanes available. Absence of the above resulted in confused attendees disoriented queues. Next, the mix of attendees waiting to enter the Grand Cathay or other halls combined into one single queue, leading to the formation of a snake-like queue. The lengthy queue even intrude into the crowd at the Snack Bar. Once again, attendees would be grateful if the queues were separated into two to prevent delaying others who are not attending the Premiere considering the fact that the extremely long queue came into existence because “Seats are available on a first-come-first-served basis”. Lastly, when the the Grand Cathay open its doors, the attendees were impatient as everyone wanted to rush in for the best seats. Would the staff be able to carry out “stringent age checks” which deny underaged individuals of entry? Or would they simply carry out their duty out of the fear of angering impatient attendees? TM and © 2012 Twentieth Century Fox Film Corporation. All rights reserved. Not for sale or duplication.